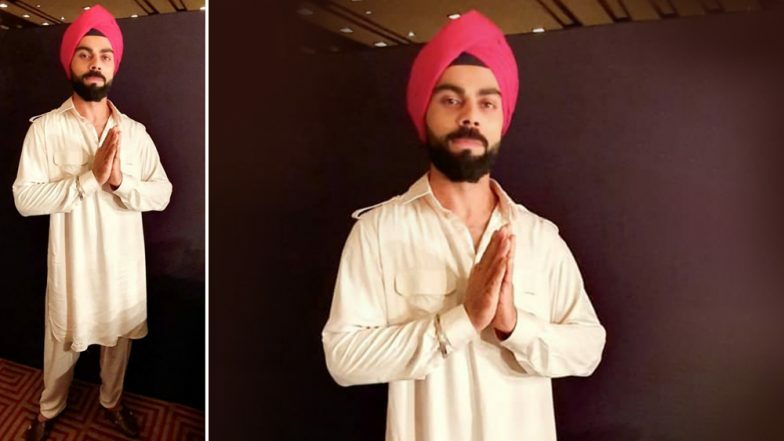 Virat Kohli shared a picture of himself dressed as a Sardar with a pink turban and put a caption that is winning hearts on the social media. It is for the first time that the Indian cricket team captain for ICC World Cup 2019 has been seen in a turban. However, the location from where Kohli has shared the image makes one wonder if it is the latest commercial that Kohli will be seen in. Virat Kohli and Anushka Sharma Off to a Romantic Holiday Post Australia and New Zealand Series, Post Cute Pics on Instagram. In the picture shared by Virat Kohli on Instagram, Kohli is seen in a creamy white Pathani with folded hands and the caption, "Sat Shri Akal saarreyaan nu! 🙏🏼." This post by Kohli is proof of the fact that Kohli is not allowing the losses faced by his IPL team, Royal Challengers Bangalore (RCB), to bog him down. Even the comments to the post have advised Virat Kohli not to take the RCB defeats seriously. Royal Challengers Bangalore is at the bottom of the points table in the IPL with six out of seven losses in this edition. Best Memes on ‘Virat Kohli Wins All ICC Awards 2019’ by Twitterati Will Make You Feel Proud and Laugh at the Same Time. Following the defeats, RCB and Virat Kohli were subjected to various memes. However, Indian cricket team fans urged the national cricket team skipper not to lose hope and focus on the upcoming Cricket World Cup. However, this post by 'Run-Machine' Virat Kohli makes it clear that he is not under any kind of pressure and is in fact enjoying his time.